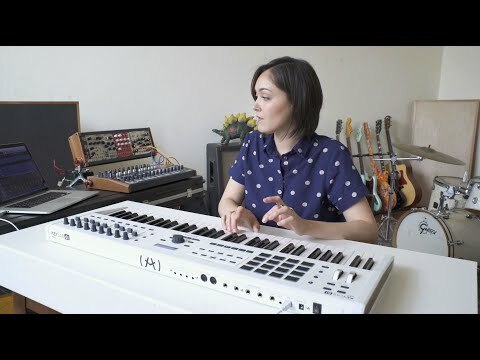 Product Overview The definitive MIDI controller keyboard, KeyLab MkII is a luxurious, expressive tool for your studio or live rig. Unsurpassed connectivity, effortless integration, customizable interface, and inspiring included software; there simply is no other MIDI controller quite like KeyLab MkII. KeyLab MkII is an expressive, versatile studio controller that works seamlessly with your DAW, virtual instruments, hardware, and modular gear. It features dynamic performance and studio controls, including a high quality 49-note keyboard with aftertouch, 16 RGB backlit pads, 9 faders, 9 rotary knobs, and dedicated DAW and transport controls. Its huge connectivity also includes CV / Gate outputs, so you can take command of outboard synth and Eurorack modules with ease. KeyLab MkII comes complete with thousands of sounds in 3 incredible software titles - Analog Lab, Piano V, and Ableton Live Lite - and works seamlessly with them to let you create music without barriers. Say “hello” to your ideal creative companion for the studio and stage. Another level in terms of quality and luxury, KeyLab MkII is a treat for the fingertips and is built to last. 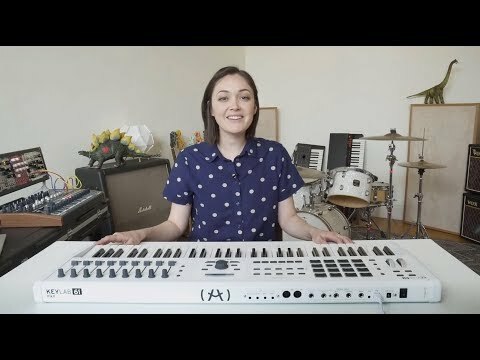 Both 49-key and 61-key versions of KeyLab MkII feature Arturia’s Pro-Feel action, the same lusciously playable keybed as the MatrixBrute and MiniBrute 2. Sensitive enough to accurately capture the subtleties and nuances of delicate playing, while still being robust enough to feel the energy of high-impact performances. Encased in durable, tour-ready aluminium and decked out with wiggle-free knobs and faders, Arturia have created a controller designed from the ground up to not let you down. Why settle for any old MIDI controller when you could be exploring your very own museum-quality collection of vintage synth and keyboard sounds? Over 6,500 are available in Analog Lab alone, which perfectly integrates with every element of KeyLab MkII so you spend more time making music, and less time staring at screens. A gateway to software, KeyLab MkII features 9 rotary encoders, 9 faders, 16 backlit RGB performance pads, and a selection of fully assignable buttons to give you unfettered access to your virtual instruments, effects, and recording environment. Send and receive CV / gate data to bridge the gap between modular and MIDI, with a fully customizable setup. Set up a complex automated sequence in your DAW, and sent it out to your Eurorack setup. Only KeyLab MkII makes it this easy. Expression doesn’t just come down to features and functions, it can be how you choose to express yourself, too. KeyLab MkII comes in both black and white options, and in 49 and 61-key versions, so whatever your studio aesthetic or size preference, Arturia have you covered. 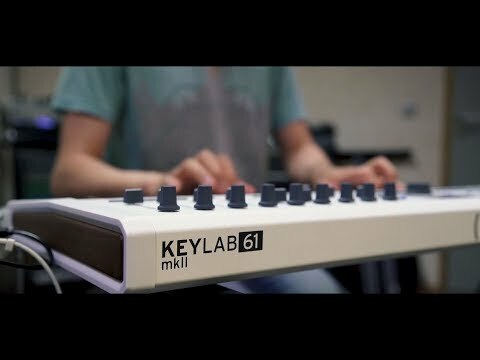 A MIDI masterpiece: KeyLab MkII doesn’t force you to make music a certain way, it lets you write the rules. • Select sounds, browse presets, switch parts, smart-assigned controls. 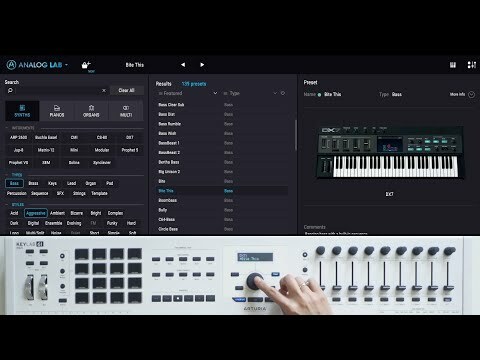 • Standalone or plug-in operation: VST, VST3, AU, AAX. • Ableton Live Lite - record, layer, and edit your sounds to create a finished song. • Piano V - Twelve different world-class pianos meticulously crafted using our critically acclaimed modeling technology.